The Port of Townsville's revamped Berth 4 container and general cargo facility was officially opened today after the completion of a $40.7 million upgrade. The two-year project has doubled the capacity of Berth 4, allowing an additional 2 million tonnes of product per annum, and delivering a 20 per cent increase on current total port tonnage throughput capacity. Port of Townsville chief executive officer Ranee Crosby said that the successful completion of the project by local company CivilPlus Constructions demonstrated the capacity for large projects to be carried out by local companies. “It is wonderful to see the berth in use already, meaning more containers, cars and cattle are moving through the port,” Ms Crosby said. “This latest investment is part of a program of works to ensure international shipping lines have reliable and efficient berth access, giving our customers efficient infrastructure to handle their cargoes. Member for Townsville Scott Stewart said the completed upgrade project generated 100 local jobs while the next phase, involving crane investment and cargo handling infrastructure, would generate 35 direct jobs during construction. 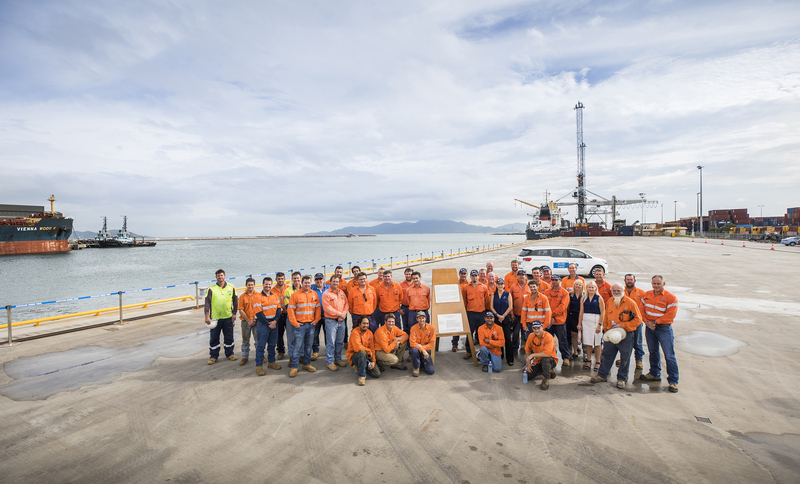 Image: The CivilPlus Constructions crew who delivered the project for the Port of Townsville. They are pictured with two commemorative plaques which will be mounted at Berth 4.